We spent over 14 days researching and testing 12 different BB creams and found that ingredients, brand reputation, and size of the bottle were most important. MISSHA M BB Cream scored high marks in all categories and is our top pick. Using this cream for a couple of weeks brought about great changes in our skin. It can be used with all skin types and has an SPF 42 PA+++. It also has a light color so it evens skin tone as well. Wrinkles were less noticeably and dark spots were lightened as well. It can be used under makeup or alone. BB cream is a product that has been popular in Asian countries for decades. They contribute BB creams to their flawless looking, porcelain skin and use it multiple ways including as a serum, primer, moisturizer, sunblock, and even a foundation. The results are a look that is soft and porcelain-like, which is one of the things that Asian women are known for. When it comes to choosing the right BB cream, there are a few things you need to look for and pay attention to about you own skin; your skin tone, skin problems, if you have any, such as Rosacea, oily skin, blackheads, wrinkles and lines. All of these are conditions that can take away from the beauty of your skin and make you look older than your age. A good quality BB cream can help stop all that damage and give your skin the nutrients it needs to look beautiful. Missha’s most popular product, the Perfect Cover BB cream, has sold over 30 million tubes all over the world. It was originally used for patients that had undergone laser treatment as a salve. The purpose of Missha BB Cream is to soothe and rebuild the skin while at the same time, providing coverage. It is suitable for all types of skin and is used as either a moisturizer underneath foundation or as the foundation itself. The bottle provides 50ml of product. It has an SPF 42 PA +++ and is a natural beige that will work with many skin tones as well. Using this product on a regular basis will protect your skin from the sun, prevent wrinkles, lessen the wrinkles that are there and will treat dark spots too. It is super easy to use. If you are using it as a primer, just apply one pump full to the skin by dabbing it on the cheeks, forehead, nose, and chin and lightly smooth it over your skin. You can also use a makeup sponge to lightly spread it as well. You can set the product with powder if you prefer a matte finish. 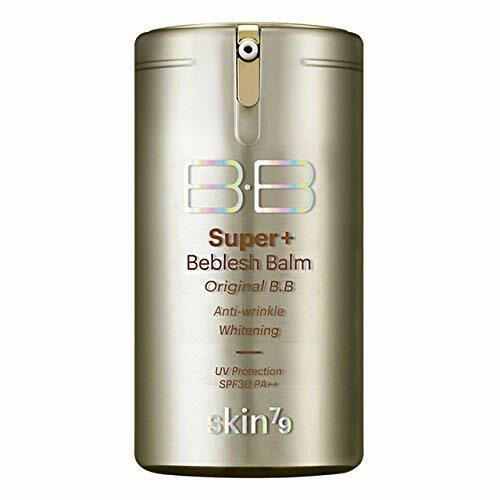 SKIN79 BeBlesh Balm has a nutritious and soft texture that gives your skin new life. It will glow and get hydrating coverage that helps the skin maintain the moisture on the surface of the skin as well as deeper. The caviar and gold extracts that are in this product reverse damaged skin and improves the elasticity as well with the ingredient Carnosine. The result is healthy smooth skin. Other ingredients that are in this excellent BB cream is Borago Officinalis Seed Oil and Phyto Collagen Liposome that prevents dryness while brightening and moistening the skin. In addition, the Argania Spinosa Kernal Oil will protect the skin from harmful things. The SPF protection is built right into the product so every time you put it on, your skin will be protected from the damaging rays of the sun. The ingredients of this product help keep the skin bright so there isn’t the usual darkening that can occur with other products. You will be very pleased with how your skin will look and feel with continued use of this product. Using this product will give you skin that is smooth, soft and bright. It will prevent skin discoloration and premature aging with ingredients like Vitamin A and B and other botanical ingredients that are eco friendly. The upgraded SPF50+PA+++ protects your skin from the damaging UV A and B rays of the sun. The triple function balm blocks the formation of melanin and helps add elasticity to sagging skin. 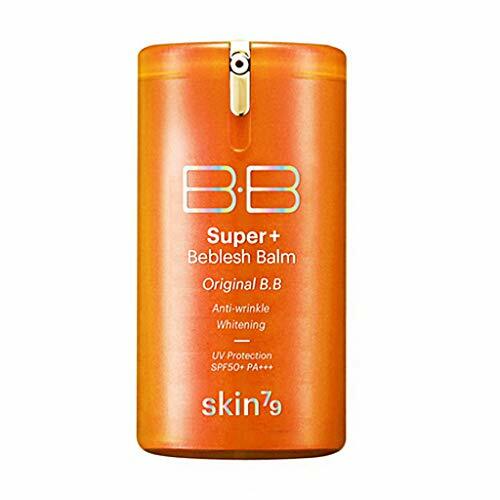 Two ingredients, Phytosphingosine and Ceramide, that are in this SKIN79 Orange Label Beblesh Balm helps to maintain the balance of the skin and strengthens the protective barrier. Other ingredients including OSMOPUR-N and Vital-V complex soothes and protects the skin from environmental damage. This BB cream absorbs easily into the skin and makes a great base for underneath foundation. Taking care of your skin before it becomes damaged is the best thing that you can do for your complexion but not everyone thinks about this ahead of time. If you want to improve the look of your skin, using a BB cream can make a big difference in the appearance and condition of your skin. The three top rated Korean BB creams featured above are all excellent products that can make a big difference in the condition, look, and feel of your skin. All three contain ingredients that protect the skin from the sun as well as environmental hazards. If you’re looking for a product that can turn the condition of your skin around, any one of these Korean BB Creams will do the trick. Read our buyer’s guide below to learn even more about how to choose the right BB cream for your skin. With the right information, you will be able to understand what to look for and what to avoid. In addition, you can sort through the different choices available and make a decision that will be the best for your skin type, skin tone and the problems you want to fix. What is Korean BB Cream? Korean BB Creams are designed to be all in one skincare solutions for anyone wanting to improve the look and feel of their skin. You’re never too old to start using a good quality Korean BB Cream so it is important to know how to choose the right one for your needs. One of the popular facts about BB creams is that they don’t cause acne by blocking the pores. The natural ingredients that they have kill the bacteria on the skin that cause acne to form in the first place and will soothe your skin from different irritants. Korean BB Creams, regardless of the brand name, have certain characteristics. We have listed them below. Many people want the coverage foundation provides but they don’t want the heaviness or pore clogging problems that regular foundation often causes. Korean BB Cream provides complete coverage, more than a traditional tinted moisturizer will, and will produce a skin tone that looks fresh, bright and even without any overdone, fake look. Many people use Korean BB Creams as a primer for underneath their foundation makeup. The order of a skin care routine starts with a cleanser and then comes a moisturizer; after that is where the Korean BB Cream comes in, because it is often used as a primer. It will smooth the surface of the skin and get it ready for the application of foundation. The BB cream will also help the makeup stay in place and not fade away. Another easy way to use Korean BB Cream is to use it as an all-in-one step since it includes everything you need in one bottle. If the coverage the BB Cream provides isn’t quite enough. You can add foundation after the BB Cream and then continue with the rest of your makeup. Korean BB Creams are made with moisturizers right inside. They have different selections available that are based on the skin type you have; for normal skin there is the light moisturizer and for dry skin there is a rich formula. Even if you have oily skin, a good moisturizer is important. When choosing the right BB cream for your needs, start off with getting one that matches the skin type you have. This will be even more important if you are using the BB cream as a moisturizer as well. Skin that glows from health is beautiful. Even though a glow from the sun looks good at first, exposing your skin to the sun’s harmful rays can have catastrophic effects on your skin later on. The majority of Korean BB Creams have some form of SPF that will shield their skin from the damaging sun’s rays. Make sure that you know how much SPF is in the BB cream you choose and supplement with additional sunscreen if needed. Many Korean BB creams can be used exactly like an anti-aging cream. There are formulas on the market that have anti-aging properties in them. They help to get rid of wrinkles and lines as well as softening and smoothing the skin. Foundation is good for evening out your skin tone but it is topical only and when you remove the foundation, the uneven skin tone is back. With Korean BB Creams, they work to get rid of discoloration and age spots completely over time. You will find that you will need less and less foundation as your skin improves. It may not be so easy to find the perfect BB cream for your needs. We have listed a few of the things that you can do to ensure that you choose the right cream. Do some Research on the Company – There are a lot of imitations out there that claim to be as good as the real thing. Make sure that you purchase your Korean BB Cream from a company that has a good reputation. Do Research on the BB Cream You Want – See what information you can find out about the BB cream that you are interested in. The three top Korean BB creams we have featured here are a good example of looking into the cream in more detail. Depending on the type of BB Cream it is, it will have different tones and properties. Find one that matches your skin tone as closely as possible. Look at Customer Reviews – Customer comments and reviews can be a big help in determining if the BB cream is right for your needs. Reading these comments can help give you some insight into how the cream performs and let you know what people do not like about it. Taking care of your skin is so important in helping it look its best even as you get older. Just because you have a birthday every year it doesn’t mean that your skin has to tell your age. Using the right face products can make all the difference in the world. Using the right Korean BB Cream can help get rid of fine lines, dark circles, wrinkles, unevenness, dark spots and more. You can use it as an after moisturizer primer or use it as an all in one primer, moisturizer, foundation. The information in this buyer’s guide was designed to help you understand what to look for in a Korean BB Cream and how to find the right one that will work its wonders on your skin. Having a bright, glowing complexion is the wish of almost every woman. Now you can get the product that will actually enable that to become a reality.